Gail I. Smith MA, RHIA, CCS-P, President of Gail Smith Consulting, LLC, is a health care consultant with more than 30 years of experience in the industry. 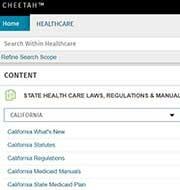 Ms. Smith has authored several coding publications including AHIMA’s Basic Current Procedural Terminology and HCPCS Coding. Ms. Smith holds a Masters degree in Education from the College of Mount St. Joseph and a Bachelor of Science degree in Health Information Administration from The Ohio State University. She is a Registered Health Information Administrator (RHIA) and a Certified Coding Specialist for Physicians (CCS-P).